My dyepots have been cool for several months now—fall is the time for collecting dye mushrooms, and it was a fairly good season, all in all—so here’s a photo of something else I made in the summer. These were in response to a call for entries for an exhibit, “Under My Feet,” put on by my fibre mentor and textile artist extraordinaire, Yvonne Stowell, in her lovely space, FibreWorks Gallery, in Madeira Park. Papermaking takes second place to dyeing and spinning, but occasionally I get the urge to mix up a vat of mushroom pulp, pull out the molds and deckles, and make a right good mucky mess. Yvonne’s call for entry came at a time when I decided I needed some slip-on shoes specifically for my studio (the bright orange Crocs just don’t do it for me), so I used a pair of almost-falling-apart house slippers as molds. I first made the soles (using pulp made from red-belted conk, or Fomitopsis pinicola), cutting several layers of paper around an outline of the slipper soles and pressing them together—”laminating” sounds more sophisticated, doesn’t it? Then I draped more cut-to-shape pieces over the tops, again pressing several layers together. I hadn’t planned how to secure the various parts to the soles, but my hands naturally went into piecrust mode, and that seemed to work, so for continuity, I continued that pattern around the backs of the soles. The shoes needed some embellishment, and I had lots of leftover Dyer’s Polypore (Phaeolus schweinitzii) pulp on hand, and I used that to make some brown diagonal bands. Phaeolus pulp is quite crumbly, and I had to be careful to keep it from falling apart. I covered everything loosely with plastic wrap, to keep the shoes from warping, but after a few weeks I noticed bits of white mold were taking root. I removed the slippers and stuffed the openings with crumpled newspaper, placed them on a mesh screen to encourage the bottoms to dry, and left them under a very loose tent of plastic. When everything had dried, the dark brown bands were still crumbly, so I gave everything a waterproofing coating. Mushroom paper being what it is, I didn’t expect to come up with anything dainty or delicate; “robust” is probably a better word to describe these (although they weigh almost nothing). However, they’ll end up being for display only—these thick soles have absolutely no capacity to bend, and stomping around flat-footed is a bit ungainly! Don’t expect me to create a line of fashionable paper shoes—not in the immediate future, anyway. 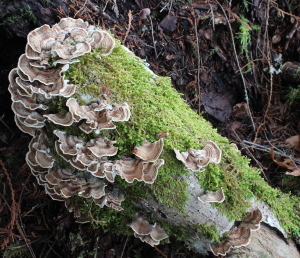 The turkeytails (Trametes versicolor) are strutting their stuff, as is their wont at this time of year. 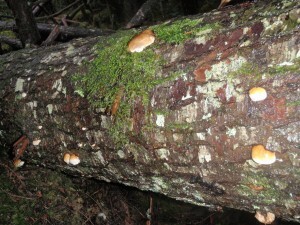 They grow in abundance on dead or dying alder and have no problem establishing a presence in our forest. (I’ve heard them referred to as the “crabgrass of the woods” for just that reason.) They thrive on a stump or log for a year and may appear in the same place the next year, but in smaller numbers. But by that time they’ll have moved on to another host. I’m picking these now, setting aside those of jewelry quality and cooking the rest, a handful at a time, for a health-giving tea, after which they go into a holding bin until such time as I’m ready to use them for paper. The forest is indeed generous. 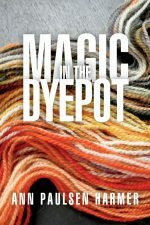 My dyepots aren’t yet exhausted, but they’re nearing the end, so it’s time to get into papermaking mindset. I spent a pleasant couple of hours in the forest this afternoon and came home with a whole bag of little red-belted conks (Fomitopsis pinicola). 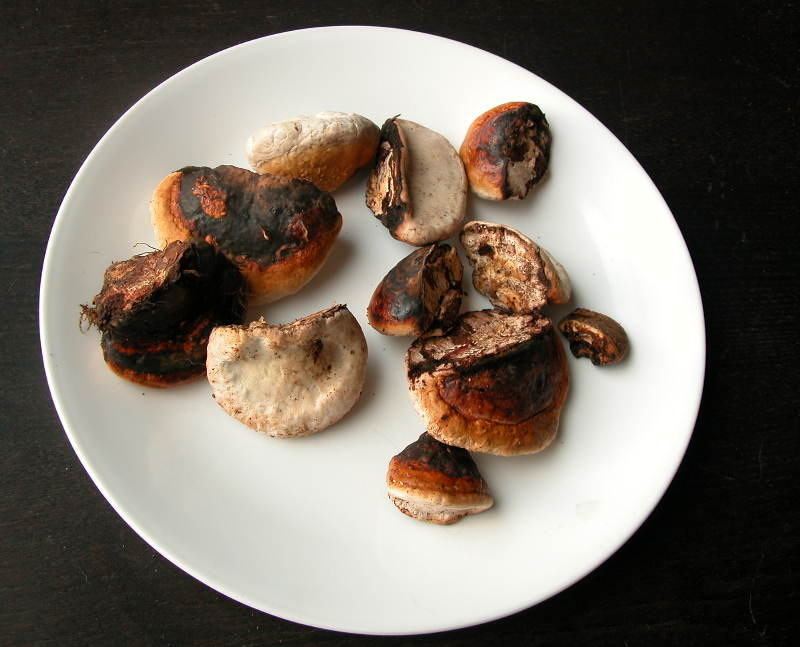 This is a ubiquitous shelf fungus that can grow to huge proportions—more than two feet wide, at times. You might well ask, Why does she not leave the small ones until they grow larger, thus resulting in more raw material? I’ve learned, dear reader, from experience. As conks grow in size, they grow harder and tougher. I’ve had some soaking for years, and they’re just as hard on the scissors (and hands) now as they were when I first picked them. Even these smallish ones will have to soak for a month or two, but they’re almost pliable at this size and will be fairly easy to handle once I’m ready for them. And with “nurse trees” like this one, I’m guaranteed a never-ending supply.